The evolution of Wilier's top bike continues. With an updated 60TON carbon frame with SEI film, the crisp and stiff Shimano Ultegra Di2 R8050 drivetrain, Mavic Ksyrium Pro Exalith wheelset, this performance-engineered road bike is ready to race. 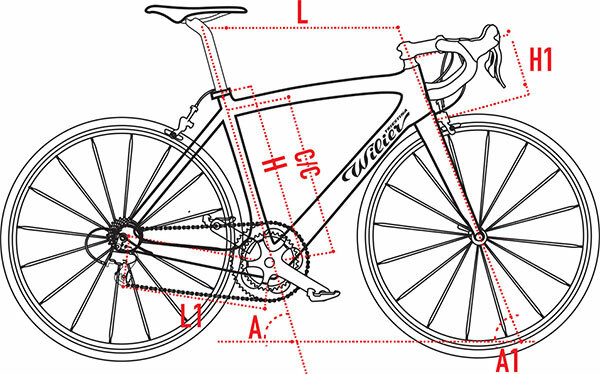 The Zero7 frame is Wilier's lighest ever frame and weighs in at a super-light 799 grams. Sporting integrated cables, an integrated fork, and supreme aerodynamic efficiency, the evolution of the Zero7 Road Bike will help you climb onto the podium. The updated frame design is possible via new construction techniques, which allows a reduction in the volume of the frame tubes by a significant 19%. A unique thermoplastic material is included to help to create uniform and equal pressure along the inner carbon walls of the Zero7 frame. This helps to create a stiff structure that's ready for raw power. BB386EVO gives the Zero7’s frame much greater stiffness in the bottom bracket area than an ordinary BB30 frame. The problem of tolerances is solved by the press fit system: bearings are integrated with a polymer cup which adapts perfectly to different diameters and can be secured inside the frame’s 46mm opening. The BB386EVO is compatible with various other conventional standards on the market. We subjected the BB386EVO to independent testing at an authoritative German research institute. They found the frame to have the stiffest bottom bracket of any frame they have ever tested. Looking back at this result, Wiliar can confidently say that framesets built using this technology are among the most highest performing on the market. With a mechanical groupset, the cable stop is positioned closer to the derailleur itself. This enables a shorter length of housing from frame to derailleur, while still allowing for optimal cable arc-maximising rear derailleur smoothness and consistency. As with the Zero7’s internal cable routing through the downtube, this cable stop keeps the rear derailleur shift cable well-tensioned and centered within the stay for a silent and frictionless shift action. When using electronic groups, the design allows the electric wiring to pass through in the cleanest way possible. The internal electric routing is optimised as well, with the wiring’s point of exit positioned well above the dropout for quick and unencumbered wheel changes.